Prepare Now … Or Be Prepared To Panic Later! On March 31, the U.S. dollar triggered and re-established its long term bear market trend, signaling a major long term sell-off. In layman’s terms; be prepared to potentially lose your buying power even more rapidly than you have over the last four decades. Simultaneously, gold prices have now had two successive monthly closes above its long-term trend line; restoring gold’s long-term growth cycle. Gold prices have risen 400% since the turn of the 21st century - from $250.00 to $1250.00/oz. - a 26% average annual gain. Gold’s growth completely eclipses the Dow Jones Industrial Average’s 54% growth over the same time frame, or 3.55% per year. So far in 2016 gold prices are up over 16%. 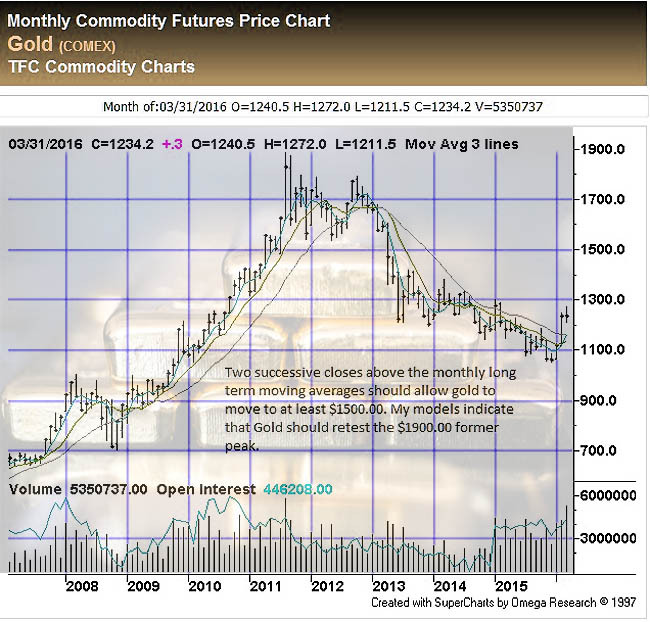 In recent years, gold has experienced significant price corrections from long-term profit taking. This price correction has left gold in position for a potentially huge run-up, based on both technical and fundamental analysis. I expect gold prices may grow at an even faster pace than in previous periods due to failed monetary policies and bankruptcies - which many states and world governments now face. With the threat of negative interest rates, massive increases in liquidity to the system (i.e. money creation) and no yields on deposits, the dollar’s resumption of its long-term decline is well overdue. Foreign governments have already begun dumping our bonds (debt). We are in for a very rough ride ahead if we are not fully prepared for unforeseen circumstances, such as stagflation. Stagflation - the economic malaise our nation faced under Jimmy Carter - is the Fed's worst nightmare. The dollar and economy decline, while inflation and gold prices rise dramatically. Today the underlying U.S. economy simply isn't healthy enough to sustain growth, which puts the Fed in a precarious position. If they lift interest rates during stagnant growth (i.e. 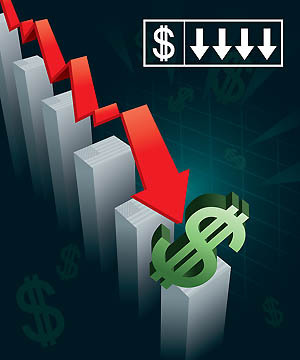 recession) with the real unemployment rates high, the economy will freeze up. The fiddling Fed will then be trapped. When higher price expectations occur, they ultimately drive higher demand. This demand puts upward pressure on prices, since a weak economy doesn't warrant increasing the production. This in turn leads to higher wages; as we already have in the states increasing the minimum wages to $15.00/hr. Rising wages further push prices higher, resulting in a continuing upward spiral. Remember, governments labor union contracts require automatic cost-of-living clauses which, like Social Security, are tied to the Consumer Price Index. This ultimately increases government payouts to workers and retirees to help cope with the rising cost of living – further boosting inflation. A very vicious cycle indeed. Stagflation also increases our bankrupt government's need for funds and causes the U.S. budget deficit to swell further into oblivion, leading to even more government borrowing. Out of control debt is disastrous; under it we can no longer control our financial destiny. Today the U.S. is viewed by our largest creditors as being so risky they havve already begun unloading our debt. This could lead to bonds becoming completely illiquid. When other countries dump our bonds, as they are now, it will ultimately drive interest rates higher and increase costs for businesses and consumers alike. Let’s learn from gold’s reaction to the 1970's in order to weather today’s economic storm. Initially gold prices rose 400%, then prices pulled back 50%. Ironically, this is identical to the gold pattern we have seen since the turn of the century. After that phase was complete in the latter seventies, gold prices spiked up 800% in a short period of time. Today such a move would be the equivalent to $9,000/oz. gold prices. Can it happen? It sure can. Today the dollar is at high risk of resuming its long-term declining trend. We now have $20 trillion in federal debt, $250 trillion in long-term unfunded liabilities and another $100 trillion in derivative debt. Frankly, anything could happen. Technically, the gold price is now above its long-term major moving average and together with the market fundamentals discussed here, gold prices could see massive gains in the years to come. Historically, gold is a pure safety. Gold will never be worthless, as some paper assets have become, and it benefits from currency declines. Based on our massive indebtedness, failing to own gold today could be a fatal retirement decision. I recommend moving a percentage of your IRAs and liquid capital into physical gold now. You will rest easier and avoid needing to panic or suffer later. Be prepared! The time to act is now.